Can Hemp Oil Make You High? Seeds tend to produce the best hemp oil, although the whole plant can be pressed for oil. Cold pressed oil which has not been refined has a rich, nutty flavor and a green tint. After refining, hemp oil becomes colorless, and the flavor is fairly minimal. There are a number of uses for it, and a variety of packaging formats as a result. Every application that uses petroleum for its skin and hair products can use hemp oil as it is more beneficial and herbal. It can be used in many health issues as either a pain reducer or even as the cure for it. 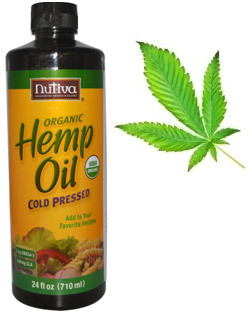 Since hemp oil is natural, it is used as a moisturizing oil which can be applied after a shower or a bath. When you massage your body with it, it nourishes the skin and increases the blood circulation. Hemp oil is used in cooking as well, though it is not suitable for high heat cooking. Along with giving a slightly nutty and crispy taste to food, it can be the perfect salad oil just in case you're out of olive oil. Another application of hemp oil is its use as biodiesel in the same manner like other vegetable oils. It is a safe replacement for petroleum as it is non-toxic and doesn't harm the environment. Almost all the forms of plastics can be made by using hemp oil instead of using petroleum as a base. As those made from petroleum, release harmful chemicals while decomposition, but those from hemp oil, don't. Hemp oil can also be used in the production of paints as it doesn't cause any harmful releases when washed down from the drain and has very low emissions than the petroleum paints which are currently being used. Hemp seed oil also provides an adequate supply of antioxidants (Vitamin E), carotene (precursor to Vitamin A), phytosterols, phospholipids and a number of minerals including calcium, magnesium, sulfur, potassium, phosphorus, along with modest amounts of iron and zinc. Hemp seed oil also provides a good source of chlorophyll. The daily recommended allowance of hemp seed oil is 14-28 ml (1 to 2 tablespoons). This allowance provides between 8 and 16 grams of Omega 6 (LA) and between 3 and 6 grams of Omega 3 (LNA). In short, no. To grow marijuna you have to have special seed that grows a plant high in THC, the property responsible for the drug response. Commercial hemp seed or hemp seed oil contains very low amounts, plus they contain a substance that counteracts THC.